The curl command can be used to transfer files over a network or from the internet using a number of different formats including http, https, ftp and even smb. The curl command has lots of different authentication methods. You can use it to access FTP sites, send emails, connect to SAMBA addresses, upload and download files and many other things. The curl command has a lot of parameters to learn. You can see a full listing of them at the curl manual page. The curl command can be used to download files from the internet, but in its basic form, you can download the web page content straight to the terminal window. The output will scroll up in the terminal window and it will show you the code for the linked webpage. Obviously, the page scrolls too fast to read and so if you wish to slow it down you should use either the less command or the more command. The problem with the basic curl command usage is that the text scrolls very fast. If you are downloading a file such as an ISO image, you don't want this going to the standard output. After the file has downloaded, you can open it in an editor or its default program determined by the file type. This will use the filename portion of the URL and make it the filename that the URL is saved to. In the above instance, the file will be called curl.htm. By default, the curl command shows a progress bar telling you how much of the transfer is left and how much data has been transferred. If you just want the command to run without a progress bar, you'll need to run it in silent mode. Then run it as a background command. Running the culr command without the progress bar is more streamlined, but you won't know how long the transfer will take or the estimated time it should complete. You can download from multiple URLs using a single curl command. Imagine you have a folder with 100 images all called image1.jpg, image2.jpg, image3.jpg, etc. You wouldn't want to have to type in all of these URLs. You can also use curly brackets to specify multiple sites with similar formats. Total %: Percent of total transfer completed. Total bytes: Total size of the transfer in bytes. Received/Transferred %: Percentage of transfer completed. Received/Transferred bytes: Number of bytes downloaded. Average download speed: Download speed in bytes per second. Average upload speed: Upload speed in bytes per second. Total time: Estimated time to complete the current operation. Time spent: Time passed since the start of transfer. Time left: Expected time to complete the transfer. Current speed: Current transfer speed in bytes per second. Imagine you have specified a URL as part of the curl command and think you have the right address to download a large file only to come back later to find that all you have is a webpage stating "this page has been redirected to www.blah.com". That would be annoying, wouldn't it? If you are downloading a large file and you have a poor internet connection then you might annoy the family if they are trying to do stuff on the internet as well. Fortunately, you can reduce the download rate with the curl command. The rate can be specified in kilobytes (k or K), megabytes (m or m) or gigabytes (g or G). Keep in mind that reducing the download speed will increase the time it takes for a transfer to complete. 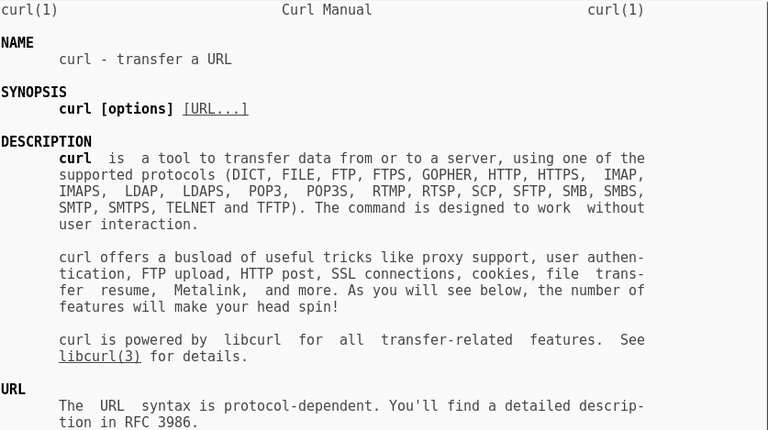 The curl command can handle more than just HTTP file transfers. It can handle FTP, GOPHER, SMB, HTTPS and many other formats. If you specify the name of a file as part of the URL then it will download the file but if you specify the name of a folder it will return a folder listing. The filenames and <URL> can use the same pattern matching as for downloading multiple HTTP files. You can use curl to fill in an online form and submit the data as if you had filled it in yourself. Many popular services such as Google block this sort of usage. There are various ways of transferring form information. The above command uses basic text, but if you want to use multi encoding which allows image transfer then you will need to use the minus F switch (-F).